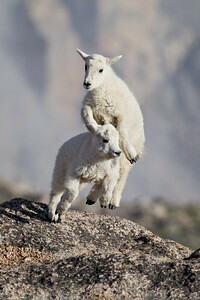 We all have a leap of faith at a crucial moment. 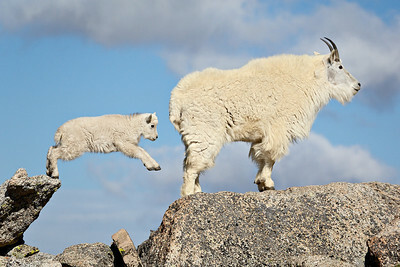 Here a newborn mountain goat (Oreamnos americanus) leaps to reach its mother. 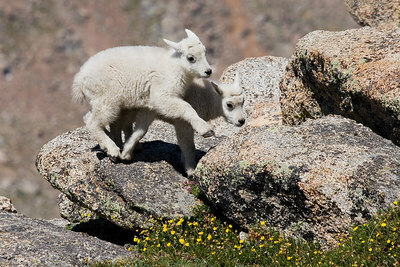 The young are very precocious and easily navigate the rugged tundra landscape only a short time after being born. 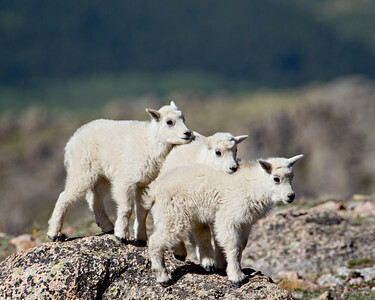 They have to be able to follow their mothers in order to survive in the Mt. 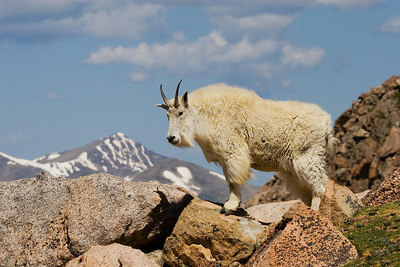 Evans Wilderness Area of Colorado. 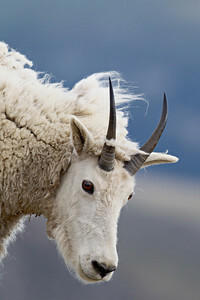 I'm excited that this one was named the Grand Prize Winner in the Nature Conservancy's 5th Annual Digital Photo Contest, and was featured on the cover of their calendar. It has become my signature image. 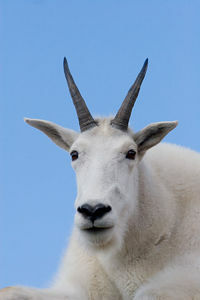 I am dedicating this image to my grandson, A, who at age 8 got to meet this little mountain goat. The kid was soooooo curious that he approached very close to A to see what he was all about. It was a very special time! 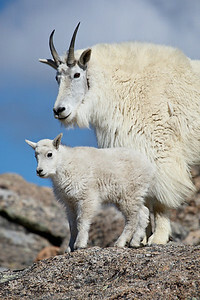 "Nanny and Kid" A mountain goat (Oreamnos americanus) nanny and her days-old kid. 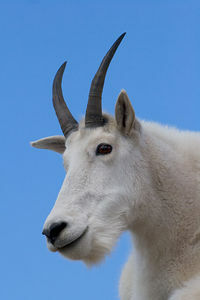 Taken in the Mt. 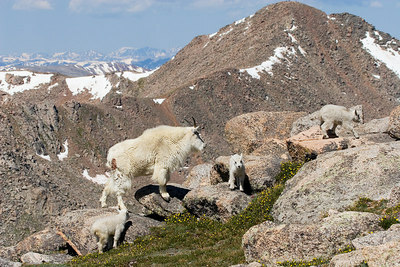 Evans Wilderness Area of Colorado. 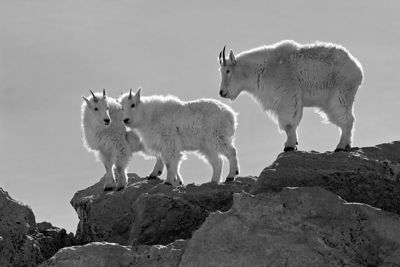 "Backlit Mountain Goats" The mountain goats (Oreamnos americanus) travel in "nursery groups." 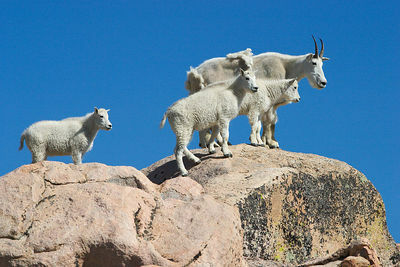 In this case, a single nanny goat was moving down the mountain with five newborn kids. An amazing sight, right as the sun was about to set. The wind was blowing all kinds of fur, dust, and rock around as this was happening. 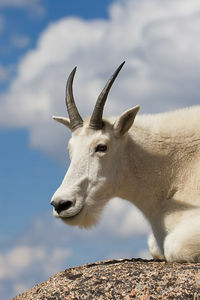 Taken in the Mt. Evans Wilderness Area, Colorado, USA. "Windblown" The wind chill on top of 14,270-foot Mt. Evans was -13 degrees (that's Fahrenheit). I was all bundled up in my heaviest winter coat, fleece hat, gloves, and wool socks. 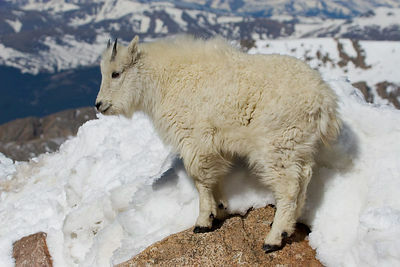 This guy had his own wool to keep him warm. 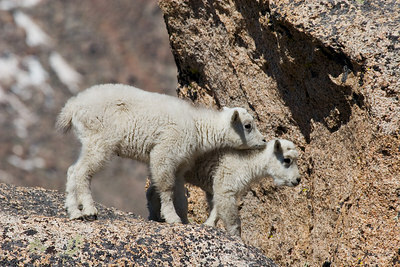 "Full of Themselves" These days-old mountain goat kids (Oreamnos americanus) were energetic and full of themselves. 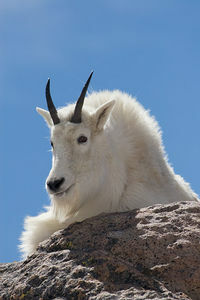 Taken in the Mt. Evans Wilderness Area, Colorado, USA. 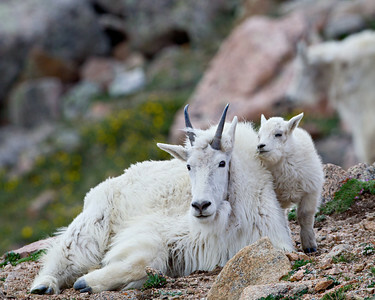 "You're So Nice and Warm, Mom" The mountain goat kid was ready to take a nap. 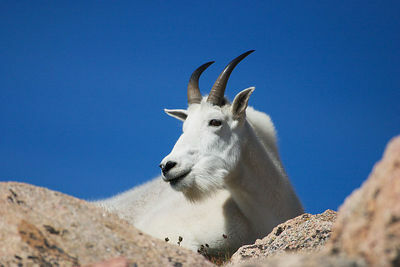 No wonder after traveling up and down the 14,000-foot peak only days after being born! 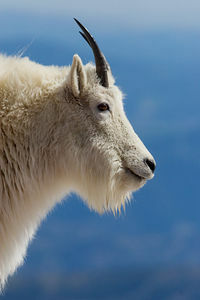 Taken in the Mt. Evans Wilderness Area, Colorado, USA. 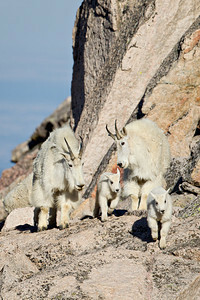 "Making Their Way" Mother mountain goats (Oreamnos americanus), also known as nannies, accompany their new babies, or kids. They are going up the face of Mt. Evans in the Mt. Evans wildnerness area of Colorado, USA. 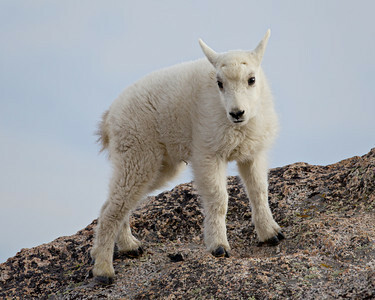 "Perfect Imperfection" Usually I'm preferentially photographing baby mountain goats, if I have a choice. 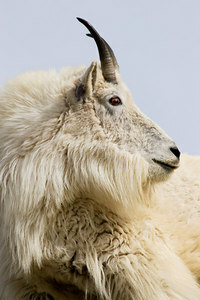 But this guy really stood out, with his shedding fur. I felt he was particularly attractive in his imperfection. 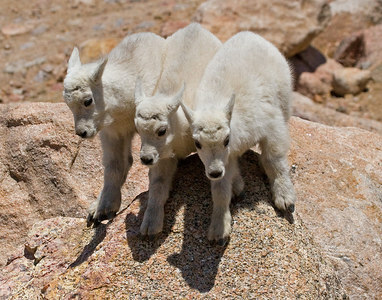 "Kids Being Kids" Three mountain goat (Oreamnos americanus) kids doing what they do best--being playful. Taken in the Mt. Evans Wilderness Area, Colorado, USA. 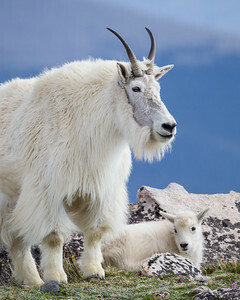 A mountain goat (Oreamnos americanus) nanny stands guard over her resting young kid. Taken in the Mt. Evans Wilderness Area, Colorado, USA. "I'm OK Up Here, Mom. Really!" 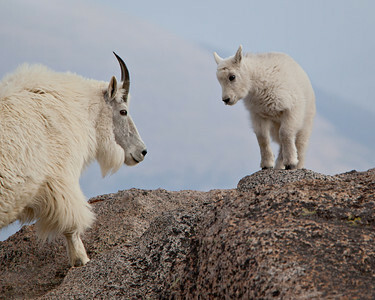 A nanny mountain goat (Oreamnos americanus) and newborn kid. 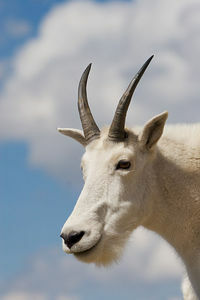 Taken in the Mt. Evans Wilderness Area, Colorado, USA. "Amongst the Vastness" I hope you can get the feeling of how vast the wilderness can be. 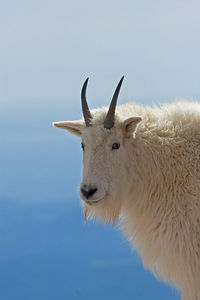 It's nice to get away from the crowds and roads sometimes and just be alone with a mountain goat in the rugged environment. Taken in the Mt. Evans Wilderness Area, Colorado, USA. 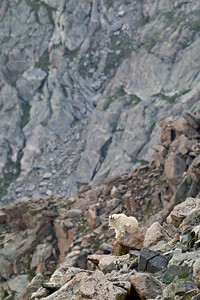 You'll definitely want to look at this in the larger version, as the mountain goat is small in the frame. 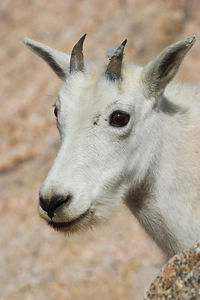 "Nanny Goat Tending the Nursery"
The mountain goats travel in "nursery" groups, mainly adult females, this year's young, and yearlings. 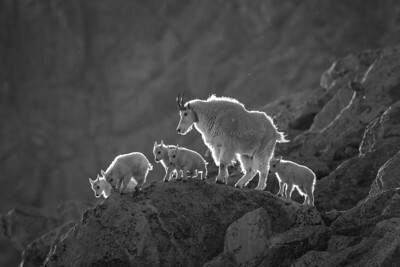 Here is a female with three kids born that spring. 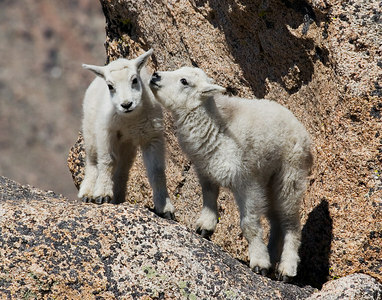 See how the little ones' horns are just tiny sprouts under their fur? 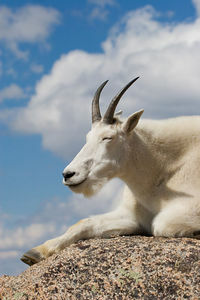 "Blissful" Enjoying a little sunshine at 14,000 feet. 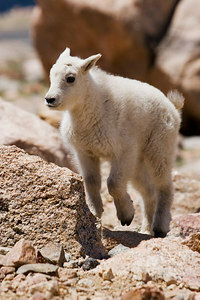 "I'll Race You Up the Mountain"
"Definitely a Newborn" A baby mountain goat (Oreamnos americanus). The kid is so young that she still has her umbilical cord showing. Taken in the Mt. Evans Wilderness Area, Colorado, USA. "Now You Kids Mind Your P's and Q's"
"The Yearling" This young one had shed most of its winter coat, but still had a bit of it caught in a horn. 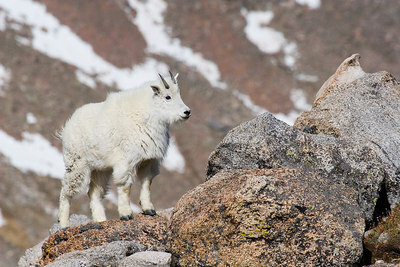 "Mountain Inhabitant" With the mountains appearing as a blue background. 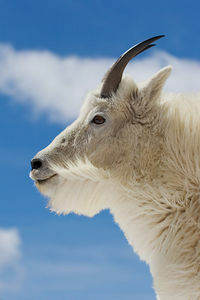 "Skylined" The goats always look spectacular against a high-altitude sky. "Wry Look" Color version. For the black and white version, see next photo. "Wry Look in B&W" Black and white version. For the color version, see previous photo. 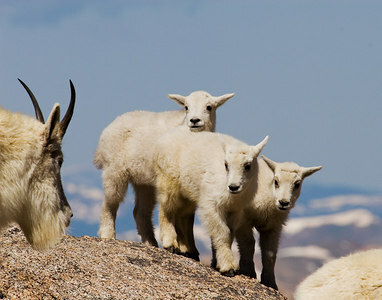 Mother mountain goats (Oreamnos americanus), also known as nannies, accompany their new babies, or kids. They are going up the face of Mt. Evans in the Mt. Evans wildnerness area of Colorado, USA.